Another Awesome $1000 Ace Race! 7 Aces, 35 Players, 25+ CTP Prizes, Good Food and Good Peoples! And, every player received a Player’s Pack: Custom Disc Golf Towel, Mini, $5 Coupon To Golf Land Warehouse, Innova Sticker and Custom Disc Golf Decal! Each Ace paid the lucky winner $142.86.. unless you’re Lucky Jay, and hit 2 Aces paying $285.72!!! Special Thanks To Our Sponsors!!! 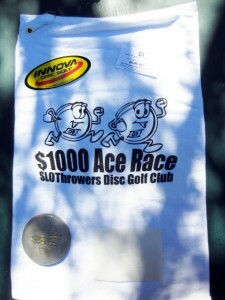 Support Those Who Support SLO Disc Golf!